Venuemob – how does it work, and why should I use it? How does Venuemob work for customers and event planners? Venuemob is completely free for customers. How? We take a 10% commission from the venues we've partnered with, of the total spend of each successfully booked event. And because each venue is competing to lock in your event, you're in the perfect spot for receiving some amazing discounts, packages and value-adds for your event. Start with your event. What are your event must-haves? What location is going to be ideal? Head to Venuemob and search with your event requirements. The number of attendees, the date, the event type, and your budget – these are vital pieces of information that'll narrow down the list of venues. Browse through the venues that match your event requirements. Each venue listing contains images of the function spaces available (some venues will have a few to choose from), along with PDF uploads of menus and function packages, frequently asked questions and a description of the venue. Venues are prompted by our team and our system to keep their availability information up to date. Both search results and the venue listings will indicate whether the venue has marked your preferred date as 'available' or to 'enquire for confirmation'. Option 1 – Make an enquiry! Once a venue – or five! – catches your eye, it's time to send them an enquiry. Press 'Enquire' to do just that. Leave the venue a message to specify what information you'd like them to provide. The venue will receive your enquiry and its details. It's often a good move to request a site visit – visiting a venue in person is truly the best way to judge whether or not it's going to be a winner. You'll be able to check out the venue's atmosphere, meet the venue manager, and in some cases even enjoy a tasting of the food on offer. If the venue has current pricing and availability, and your event meets the minimum spend requirement, you can opt to book immediately. You have the option of browsing the venue's packages on offer and arranging the food and drinks for the get-go, or you can opt to arrange the finer details later. You can also opt for specifics such as AV, entertainment or any other specific requests. To secure your booking, enter your payment details. Your card will not be charged unless the venue accepts your event and details, locking in your booking. Once the venue receives your booking request, they can accept your booking. At this point, it's locked in! Just like that. How many venues should I enquire with? We recommend sending enquiries to at least three venues. Multiple enquiries means more options to choose from, more bargaining power, and a greater insight into what your event can truly be. The venues will message you on the Venuemob system – you'll receive an email notification alerting you to each new message. 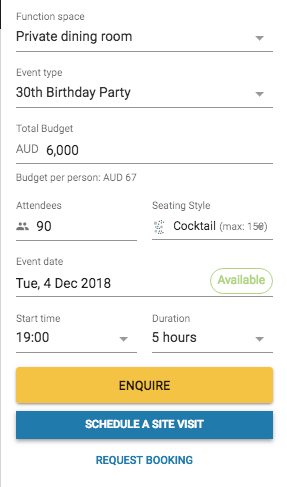 The venue will also likely give you a call to chat through your event's unique requirements. Chat to the venues to your heart's content, and then choose the perfect one. Remember to update the status of your event from 'Pending' to 'Booked'! Of course, if you have any issues or you need an extra helping hand, don't hesitate to contact the team here at Venuemob – our Venue Bookings team has a wealth of knowledge when it comes to events, and choosing unique, beautiful and jaw-dropping venues. Just email customers@venuemob.com.au and we'll be there ready to help. And if you're a corporate customer in need of a business solution for your calendar of events, that's great. Head to our Business Events page to get started.